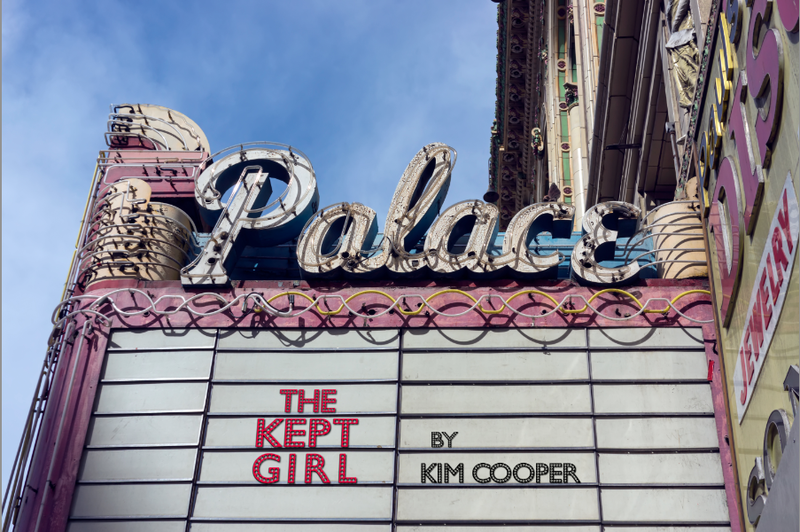 Kim Cooper's "The Kept Girl": Come, Let us Party Like Book Patrons Do! 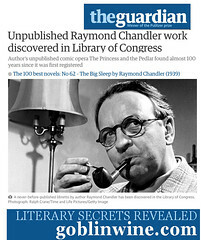 Come, Let us Party Like Book Patrons Do! Writing a book is a lonesome experience -- at least it is for me. When I'm at my desk, whether plotting, hacking out a paragraph, or deep in the archival research that informs my historic narratives, it feels like I'm completely alone in the world. My subjects have been dead for decades, their homes and offices bulldozed or forever transformed, even the language they use is different from how we speak today. When I do my job right, I've got one foot so far in the past that a ringing telephone is just as startling as if it were breaking into a dream. It's a sort of time travel, with no room for a sidekick to tag along. And brutally hard as the work is, I love the feeling of being transported for a while. I'm told that there are writers who thrive on workshopping. They share the day's pages with their loved ones at the dinner table, or bring new chapters to writer's groups for feedback and inspiration. Even typing those words out makes my skin crawl. I think of a work-in-progress as an ugly little bundle of raw nerves, wrong words and half-baked ideas. It has to metaphorically settle, spend some time in the rock tumbler, sit on the counter with a wet cloth on top, be examined with a magnifying loupe, take a couple hundred trips around the block and generally be worked to death and back again before I'd dream of subjecting anyone else to its company. 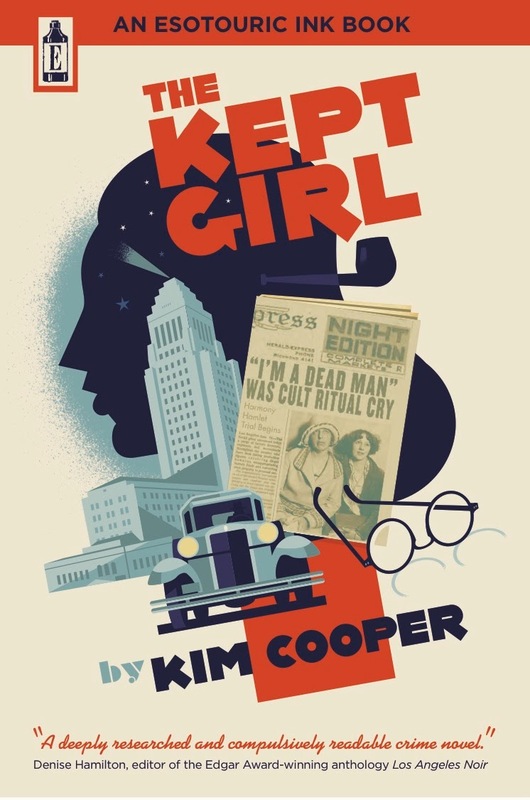 The Kept Girl took about a year and a half to write and edit, preceded by six years of sporadic research into the true crimes featured within. It was only in the last six months that I began sharing what I had with trusted readers and incorporating their feedback. And then, rather suddenly, it was finished. The book was set in print, final edits were made to ensure the paragraphs flowed prettily, the covers were printed, the pages were folded and trimmed and bound, the Art Deco wraps (video link) produced for the Subscribers' edition and my oft-tumbled little baby was sent out into the world. Then a couple of months later, it was time for a party. 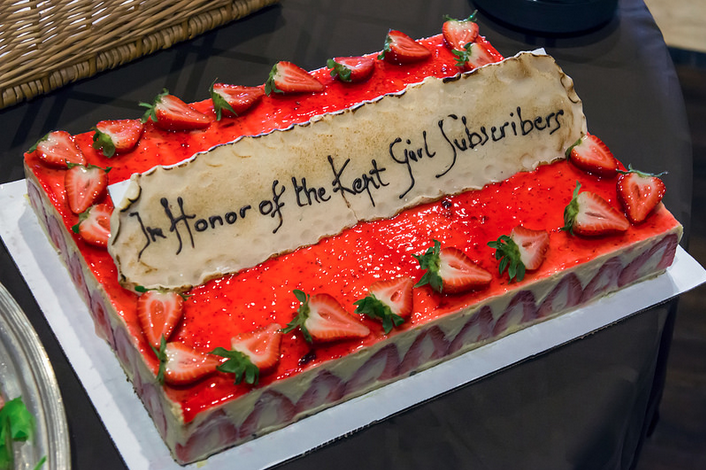 The Kept Girl was published by the subscription method, with 65 generous and gracious readers supporting the project through their advance purchase of the deluxe edition. Their belief in the project was enormously encouraging, and I wanted to do something really nice to reward their faith and celebrate what we had accomplished together. 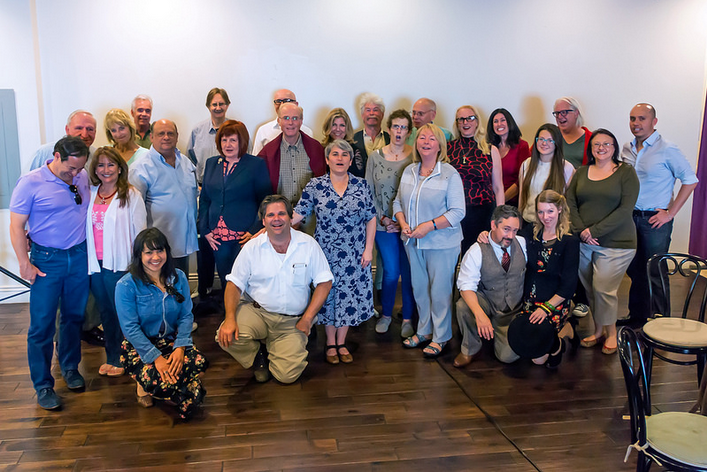 The Subscribers' Appreciation Party brought about half of that charmed body together for an afternoon's walking tour, followed by cake, wine and conversation upstairs at Figaro Bistro in Downtown Los Angeles. 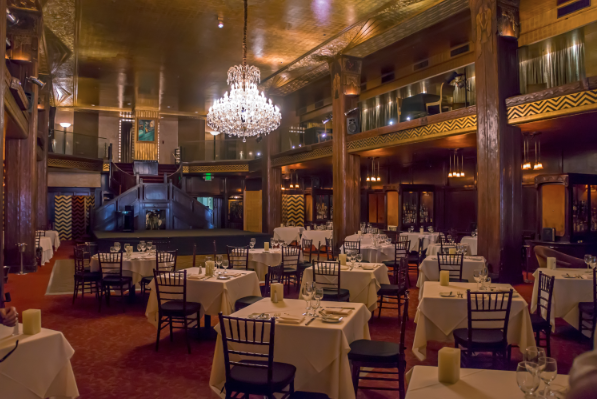 This pretty place was formerly the historic Schaber's Cafeteria and is the home of our monthly LAVA Sunday Salon. It's always a pleasure to host a gathering in this room, but this one felt different, more charged. David Smay gives a tug. 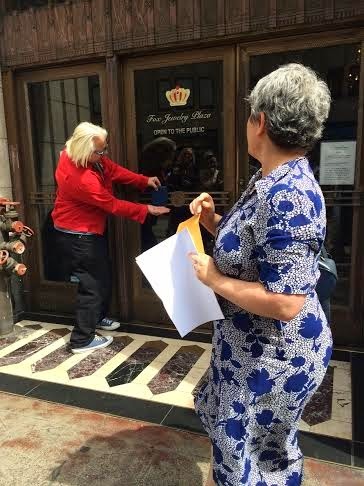 We began the festivities at the southeast corner of 6th and Hill Streets, to see the handsome doorway that inspired the design of the deluxe edition wraps. 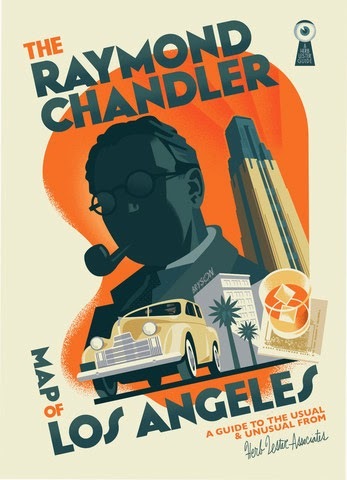 This was the first in a series of stops highlighting the real locations featured in the novel, and in the life and work of my hero, Raymond Chandler. 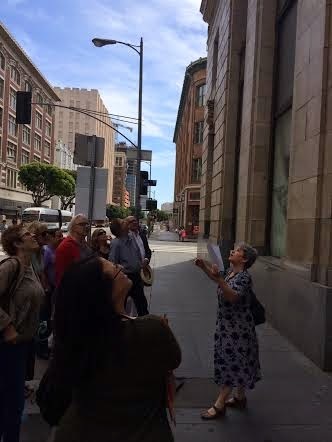 At Sixth and Olive we visited the Oviatt Building, which Chandler called the Treloar in The Lady in the Lake, in tribute to the Harvard-educated bodybuilder who ran the gym at the Los Angeles Athletic Club a block away. 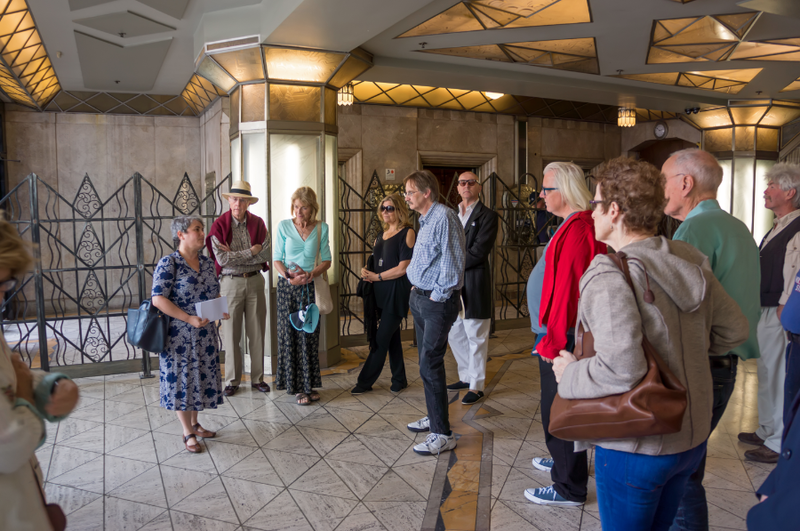 Although the Art Deco entryway lost much of its historic glass when Oviatt lost his mind in the 1960s and sold it off to an admirer for $50, it remains a powerful portal into the jazz age city, and we were grateful for the opportunity to peep inside the stunning, and largely unchanged, retail floor which Chandler called the Gillerlain Company and where today you can dine and dance at the Cicada Club. 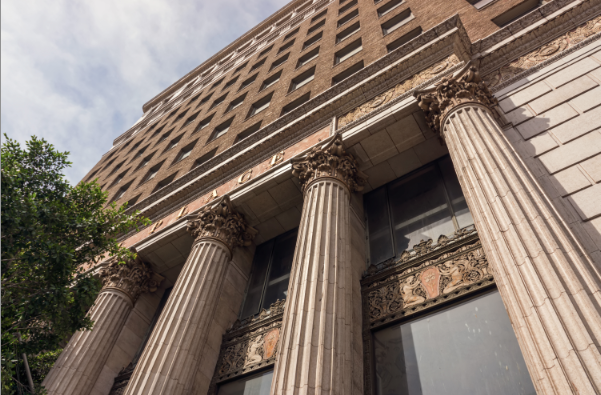 At Seventh and Olive, we admired the ruined hulk of the Bank of Italy, the Romanesque masterpiece where Chandler worked as an executive with the Dabney Oil Syndicate through the 1920s. It was the 1929 fraud complaint made by Dabney's nephew that sparked the investigation into the Great Eleven cult that revealed the terrible secrets that form my novel's core. The building is, despite its long neglect and the foul odors in its windbreak doorways, still very beautiful. We all said a small prayer that it might be sold to kinder owners and reopened one day. Across the street, we gazed up at the windows of the Athletic Club, where Chandler listened in as big and often brutal deals were made by the kings of old Los Angeles, and where I spent many hallucinatory hours in the sauna, tapping into the rhythms of the lost city to write the dialogue for The Kept Girl. Then out along 7th Street, in the panicked footsteps of my fictional Ray, as he races off to tell his policeman friend Tom James that Muriel Fischer, Ray's brave secretary and mistress, is in danger among the cultists. 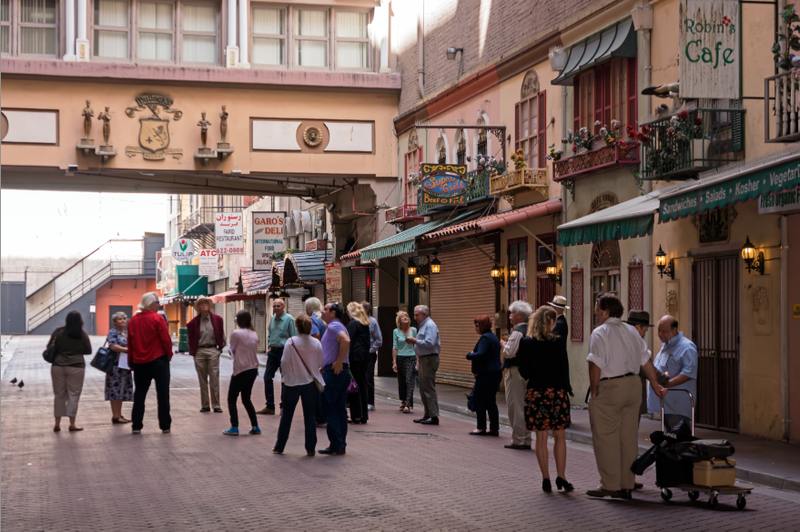 We stopped at Saint Vincent Court, the historic pathway with its many layers of Los Angeles history. In the book, Tom plants Ray among the trash cans while he alerts headquarters that another cop is needed on his beat. Our next stop was 7th & Broadway, where Tom was stationed, and preached his gospel of civic reform, some years before "Cafeteria Kid" Clifford Clinton would take up the mantle and brave police-sanctioned bombings to get a crooked Mayor recalled. Although somewhat famous in his day, Tom's bravery had been forgotten until my friend Lynn Peril gave me a copy of his self-published whistleblower pamphlet. It's a strange, good, feeling to stand at "his" corner and share the story of Tom's belief in a fair and ethical Los Angeles. The remainder of our walk took us up one of the handsomest blocks on Broadway, along the decorative terrazzo paths and beneath the theatrical marquees that would have been so familiar to the young Chandler. We returned to Figaro's mezzanine to find a lovely spread of bread, cheese and meat selections, and glasses of wine for toasting, awaiting us. The afternoon continued with a delightful party, as folks split off into smaller groups to talk, snack and examine "trading cards" from the novel that I'd prepared so they could see what the real life characters actually looked like. I signed a few books and answered questions, and got a chance to hear what some of my guests, who are quite a creative bunch, had been working on. Figaro's owner, Jonathan Mgaieth, had prepared a beautiful and sinfully delicious berry custard confection on a dark chocolate base, with an edible marzipan inscription. 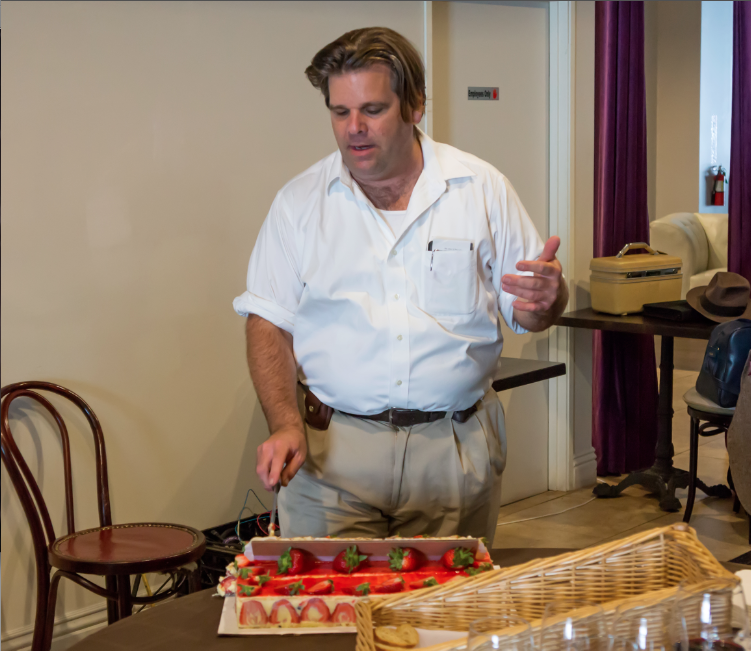 It was like he'd peeked into my soul and found the perfect dessert to share with such a special group of people. The flavor profile evoked my late grandmother Becky's signature Trifle Pudding, while the sophisticated presentation was the thing to please my Francophile grandma (and famous Yelper) Cutie. 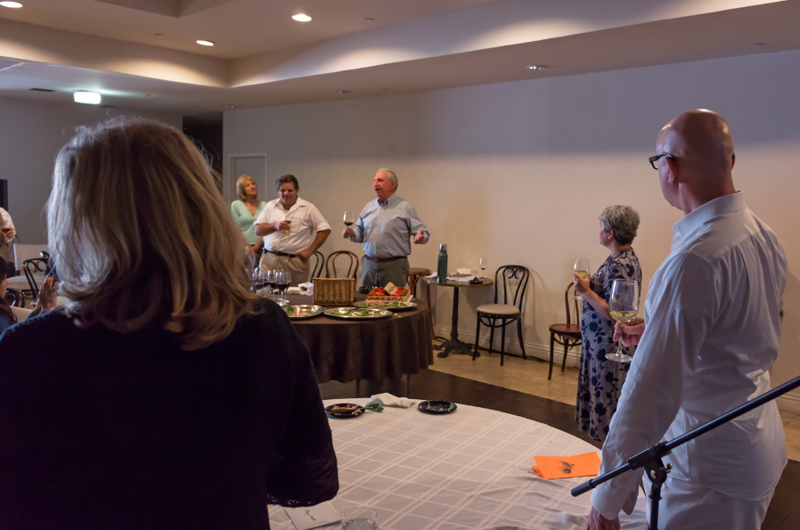 When the time came to cut into the cake, Subscriber Jerry Joseph surprised me by lifting a glass of wine and making a very beautiful toast, thanking me for conjuring up this lost world and bringing him and so many nice people along for the ride. It was such a gracious toast. I felt so grateful, and at a loss for words. Then Richard, my wonderful husband who believed in this book long before I did, and who has so generously given of his time and talent to nurse it into being, cut into the cake and passed the pieces around, to much oo-ing and ah-ing. Conversation stopped, then bubbled up again, and all too soon it was getting to be time for folks to be going. We all gathered then for a group photo, before splitting off into our component parts, having come together to celebrate a little tale with a long history, and 65 goodhearted heroes whose faith helped make it soar. And as I packed up the last bit of cake to enjoy at home with my family, I laughed aloud for ever having thought it lonesome to write this book. See all of J. Scott Smith's photos here.